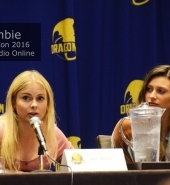 Review of ‘iZombie‘ Panel at Dragon Con 2016 by thevro.com. This past weekend, thousands of fans of varying fandoms gathered in downtown Atlanta for Dragon Con 2016. Among these fans were the hundreds of celebrity guests that also attended. 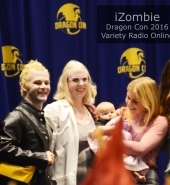 Rose McIver, Aly Michalka and David Anders from The CW’s iZombie were some of these guests. 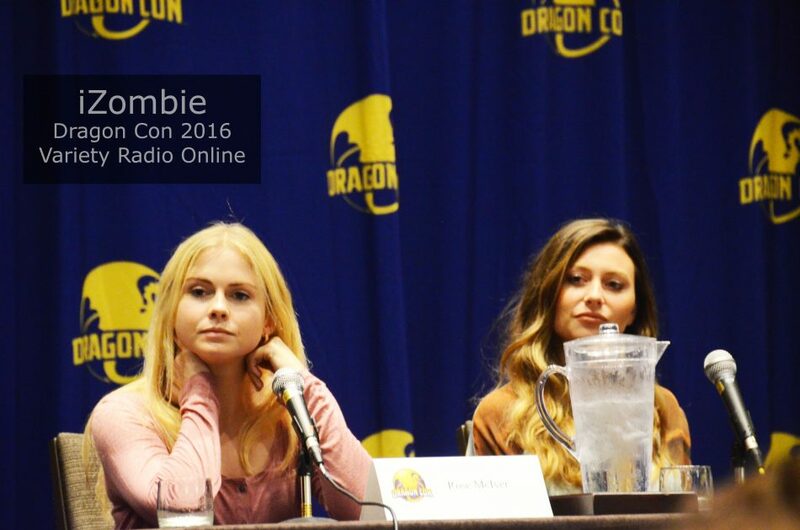 iZombie put on a panel throughout several days of the convention but we managed to catch their Sunday panel. The Peachtree Ballroom of the Westin hotel was packed with iZombie fans and the panel was filled with energy and great questions and answers. One fan’s question was about which characteristics that Liv and Blaine take on from brain consumption was their favorite to play or play off of. David Anders revealed that he loved Liv’s stoner brain characteristics. 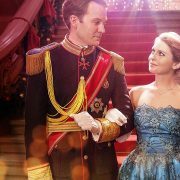 Rose McIver revealed that she didn’t really have a favorite but she did dislike playing the judgemental brain characteristics. She did let it slip that she and Robert Buckley would be consuming the brains of a father and daughter in a future episode. The twist? Robert Buckley’s character Major would be receiving the daughter’s brains. According to McIver, this was the role that Buckley was born to play. When asked about the possibility of a crossover, all three guests seemed to agree that they would crossover with any of the shows that film where they do. Arrow, The Flash and Once Upon a Time were all mentioned by name, though they are all open to anything. The three cast members also mentioned that they are very close with not only their fellow cast members, but also the casts of other CW shows and actors that film in Canada near them. An audience member asked Rose McIver if there has ever been any discussion in the writer’s room about having her character, Liv Moore, consume the brains of a child. According to Rose McIver, the idea has been brought up in large part by her. She believes that it would be interesting for Liv to take on the characteristics of a child and help to solve their murder. McIver was also careful with her words, saying that she couldn’t go into detail but the question was relevant to an upcoming episode. 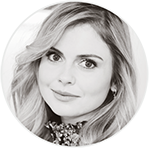 The question on what the actresses liked and disliked about their characters, Rose McIver admitted that she wishes Liv would keep more in contact with her family. 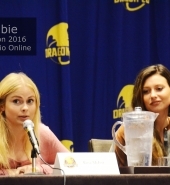 Aly Michalka loves that her character Peyton is so loyal to her friendship with Liv. According to Michalka, no matter what happens between them or what space that they each may need, Liv and Peyton will always be best friends. As for dislikes, Michalka does wish that Peyton wouldn’t let the men in her life impact her as much as they do. She would prefer if Peyton took some time alone to figure out what it is that she wants out of life. On the topic of romantic interests, Rose McIver told the audience that she has been promised that if Liv gets a new boyfriend, the writers will not kill him off. When asked whether or not her character Liv would get back together with Robert Buckley’s character Major, she said that she would like to see them reunite romantically but only when it is right for the both of them. Aly Michalka revealed that she does love Peyton and Ravi’s dynamic but their future is ultimately up to the writers and that fans should stay tuned for season three. David Anders who plays the problematic Blaine on the show was asked about what it is about him that causes him to constantly be cast as the bad guy. According to Anders, once casting directors see you play a certain type of role very well, they typically want to continue to see you in that role. He also told us the story about when he went up against a Twilight actor for a role. 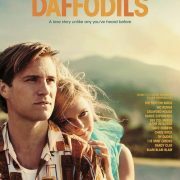 According to Anders, he was convinced that he wouldn’t get the part because he thought of himself as a more minor actor. To his surprise and delight, he won the casting directors over and got the part, proving that he had a diverse acting range. Another fan question directed at all three cast members asked what they thought was the most odd scene that they had to film. David Anders told the audience that even though it wasn’t the first time one of his characters had been buried alive, it is still a sensation he isn’t used to. 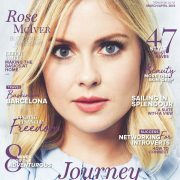 Rose McIver revealed that it surprised her how often Liv was holding onto a moving vehicle and that she found it strange to act out. Aly Michalka explained that she didn’t think she had to act out any strange scenes to which Rose jokingly asked “Weren’t you just hog-tied in an episode?” to which Michalka laughed and agreed that that was probably as strange as it got for her so far. On a more serious note, when asked about the stereotype that strong women have to be fierce fighters all the time, Rose McIver and Aly Michalka both spoke out on the value of silent strength. According to Michalka, her favorite scenes to act out were the ones where Peyton struggles to come to terms with learning that Liv is a zombie. Rose also added that she personally doesn’t want to be seen as the constantly tough woman that this stereotype displays and she hopes that her character, Liv, shows women everywhere that you can be strong in more ways than one. The age old question of whether or not they would be able to cope as a zombie was also asked. All three agreed that after being on the show, they would be much better at coping with the change. At the end of the panel, Rose McIver asked a man from the audience cosplaying as Blaine to come up to the stage for a photo. Not only was he dressed as Blaine, but he was also holding his child which Rose said was very unnerving to see Blaine holding a small child. Rose asked to hold the child and pose for a “family photo” which you can see in our gallery and in our featured image. Overall, this panel was very entertaining and all three guests were very interactive with the fans. Sometimes you are able to tell if a cast does not get along as well as they say that they do, but the cast of iZombie seems very close. Not only that, but they truly love their fans. This positive energy resulted in a very fun panel which was a high point of my Dragon Con experience.